Back in the workshop. – Dirty wet dog , boats and sailing. DirtyWetDog May 26, 2017 July 31, 2017 Blog post, Boats, Fitness blog. I almost the called this one “THE back in the workshop” as mine feels as though it needs a re-build right now !. Its improving a bit though in that today i actually managed to heave the workshop door open and stand for long enough so that i could run a strip of glass down the leading edge of the rudder blade and then only because my partner battled though the evening traffic to go and get me some fresh epoxy : i tried but couldn’t even stand to sit in the car for that long ! The problems with the rudder were that 1.it was loose in the cheeks and 2 that there was something wrong with most of whatever base coat was applied over the timber. By early in the week i had the loose coating all ground off using a soft sanding disk on a battery grinder (must get a new cheapo one for jobs like these) smoothed it all off and laminated a panel of glass cloth onto each face. Today i ran a strip of GRP bandage down the leading edge which should be ok as its got a reasonable curve : i’m not so sure about the trailing edge which is sharp….not sure that would take a wrap. Next i either need to build up the upper part of each face that bears in the cheeks to take out the slop and/or find some appropriate wide but thin washers and maybe thin fibre ones….and then of course try to waggle the whole thing together on the water and i definitely can’t cope with hanging over the back of a dinghy and holding the heavy board and balance washers bolt and nut !. Once all the glass is on obviously i will have to re-fair the blade and then bore out the bearing hole again for its bush and bore/fill/bore a new hole for a new downhaul line as that was a bare hole and clearly getting the wood wet behind its coating so i will do a wider hole, cast a plug and then bore through that. It does also need a better arrangement in the cockpit for the running part of the downhaul line. 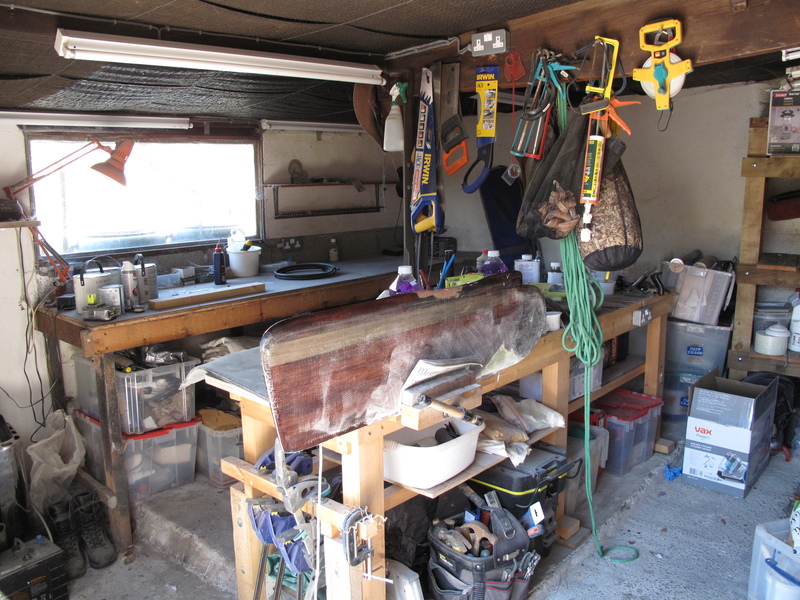 Sailing is definitely off the menu for a while yet until my back wants to behave again, i really should try and tidy the workshop but that means heaving heavy crap around and thats not going to happen either. Maybe i should just go and blow up a hoover after i have edited the next video ! Previous What the IOR did for us. Next Cruising log : May. That back does not sound good Steve. have you thought of a couple of large diameter plastic washers for the rudder blade, you maybe able to find some slip sheets from pallets that are about 2 mm thick that would probably do. What sort of gap do you have to fill ? Now where’s that hoover …. I was looking for something like that to make some from. Once i can move again i will offer it up and see how much additional space there is to take up…..should be less now as there will be 4 layers of glass extra.